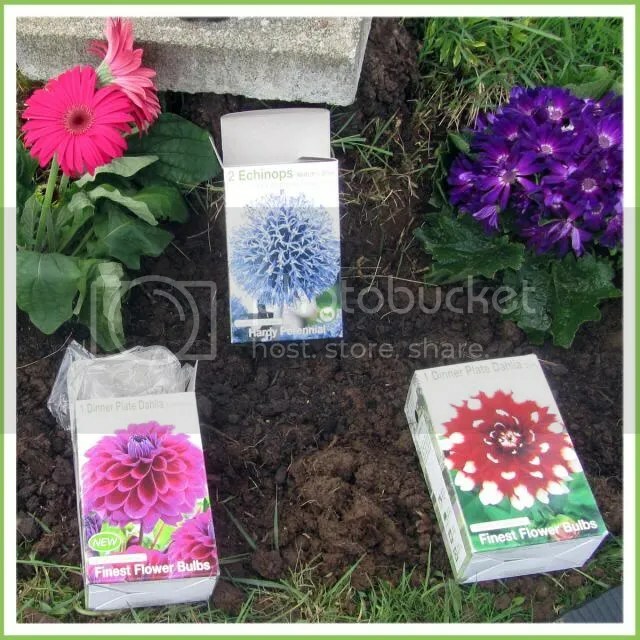 I was looking for watering pots, but most are plastic, the few that are metal are expensive and will probably rust. I was using a canning jar for a while, when I realized that we had an extra glass pitcher! Eureka! It was one we’d picked up at goodwill for three dollars one day, and easy as breathing now it’s my new watering pot!! 1. Dig Hole the right size for bricks. 2. Put down a layer of gravel, then a layer of sand. 3. Place all the bricks. 4. 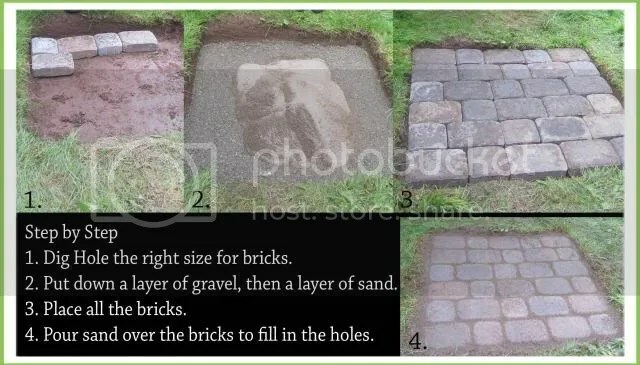 Pour sand over the bricks to fill in the holes. 5. Place a fire bowl on top of the bricks, chairs around it, and enjoy a s’more! I found this AWESOME list on pintrest!! I had no idea we could compost so many things around the house, so I copied and pasted the list into a new Word Doc, deleted the things that don’t apply to us, made the font a little larger, and put it in two columns to get it on one sheet of paper. 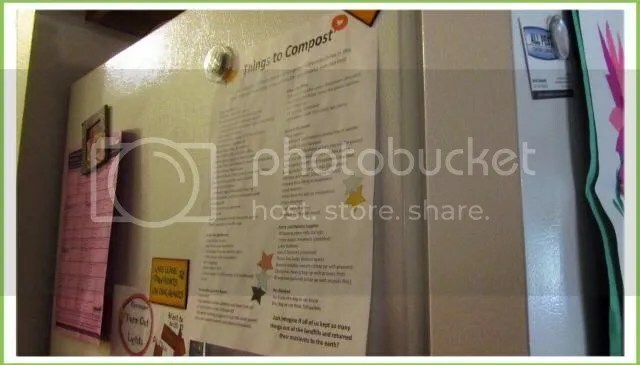 I’ve since posted it on the side of the fridge as a reminder and resource of what we are able to compost. 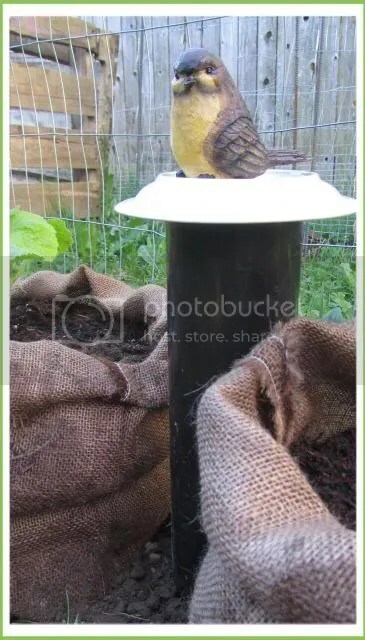 I happened to see worm farm PVC tubes on some website that I was browsing, and it stayed in the back of mind for a while before I really researched how to do it. Turns out, it’s simple! I bought a couple three inch wide PVC pipes, they were precut to two foot long. We drilled lots of holes in the bottom half of the pipes, then buried them about a foot in the ground. I bought $1 plates from goodwill to put on top of them, and done! The little bird statue is from the dollar store. We’ve already started tossing in the smaller compost scraps for the worms, and I like the ease of knowing that we are feeding garden worms without having to maintain a worm farm bin. I saw this photo on Pintrest, and not realizing that was a tire got very attached to making one. 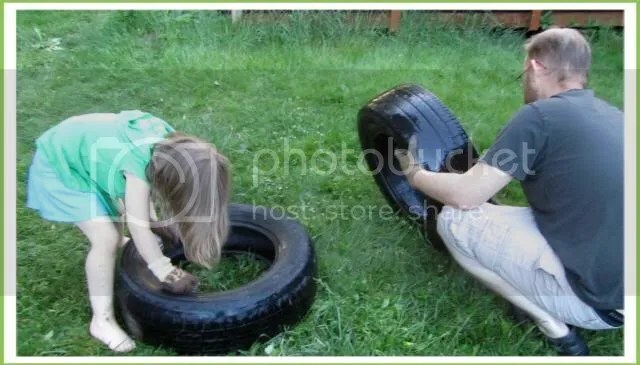 I only hesitated slightly when discovering that it was a tire, figuring that it could not be too hard to make. I researched thoroughly how to cut and how to turn the tire, using mostly google search, pintrest, and youtube. I even went so far as to buy the supplies, and bike with my trailer to get a couple tires. But when we tried cleaning them we could not get them clean enough that any of us wanted a touch them enough to turn them inside out. So sadly, this was a bust. -Use a hooked roofing tool for fast slicing through the tire part. -This will take at least two strong adults to accomplish easily. 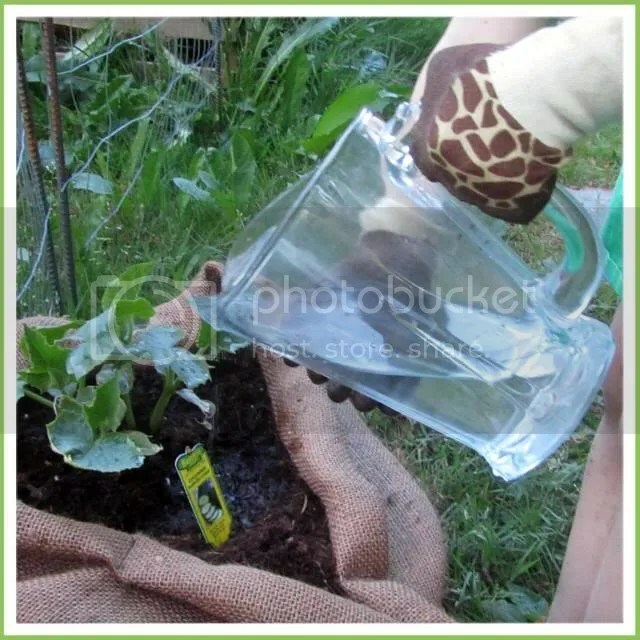 -Remember to make holes in the bottom for proper drainage. -Use a base coat of primer paint before painting on your colored paint. 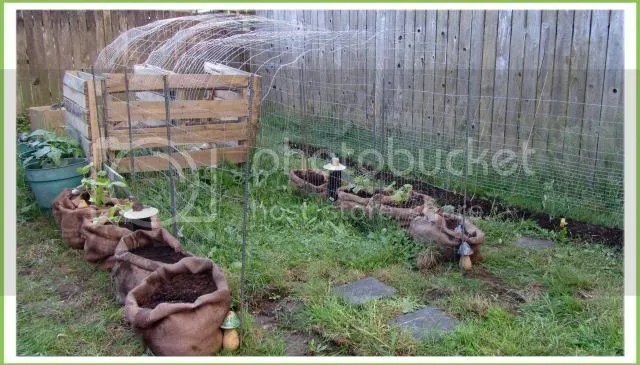 I saw this photo on Pintrest, and thought how great that would be for another children’s garden hideaway, a little lower and it would be a tunnel! Push rebar where you want it, (after soaking the ground, or a good rain). Cut strips of the fence roll, and weave it into rebar. All told it took three people an hour to construct, and at about $70 total this was the most expensive object in the garden, but soooo worth it!! I can’t wait to see cucumbers and squash climb all over the thing! 2. Sew up the side to form a tube. You could stop there, however even though I wanted an open bottom ‘bag’, I also wanted the dirt to be able to hold the bag in place, so sewed only the bottom corners of the bag, about three inches in on each side. 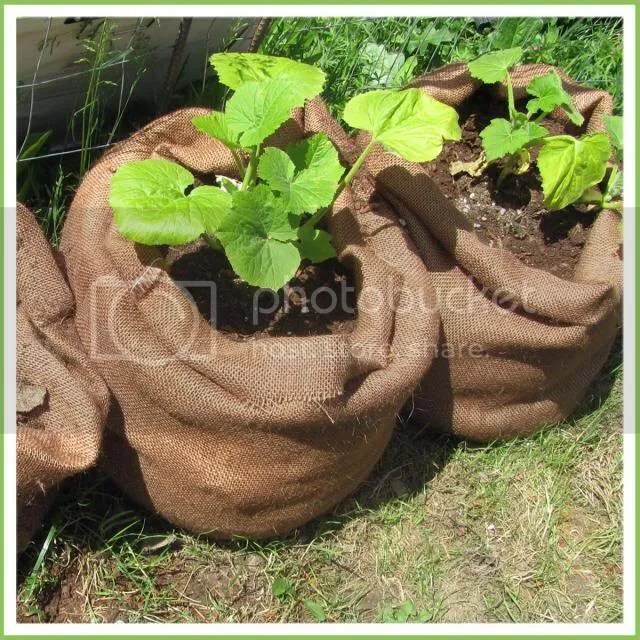 Also, I like the rolled down look at the top of the bag, but was having a hard time keeping the top of new burlap rolled, so I tacked it down in all four ‘corners’ of the bag. So, while crude but effective, this was the neat result! 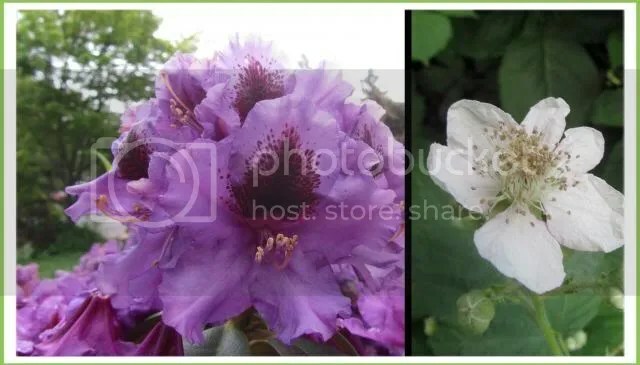 Our front yard rhododendron and our very first blackberry bloom!! 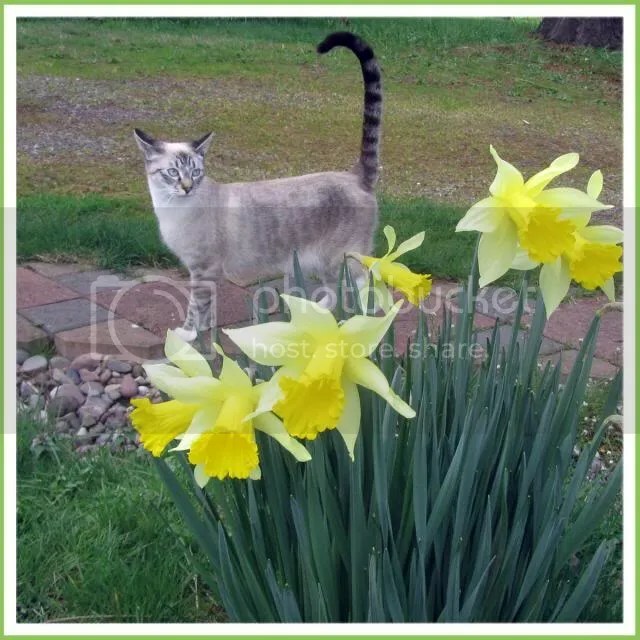 Spring is finally really here!! 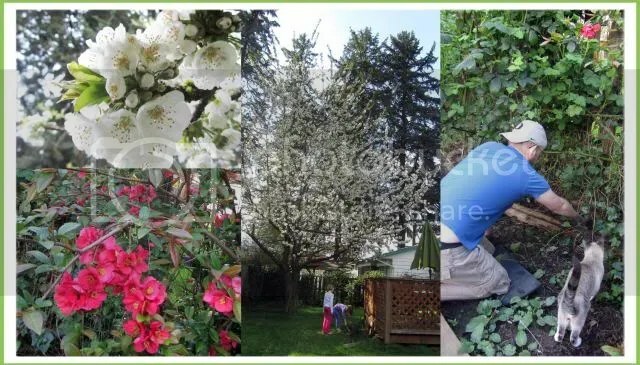 This weekend the huge cherry tree finished blooming and we did a little pre-gardening, and some weeding around the blackberries! We did our first gardening of the year! With a couple starters, and some summer bulbs we are off to a great start! 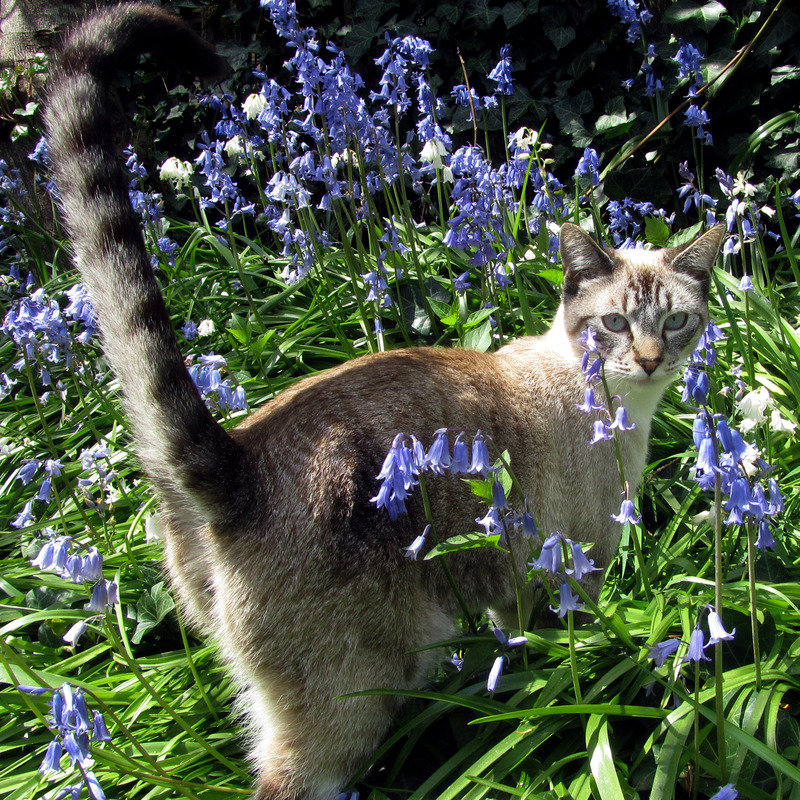 We were helped a bit by our new kitty, who is very much enjoying his first spring ever!! 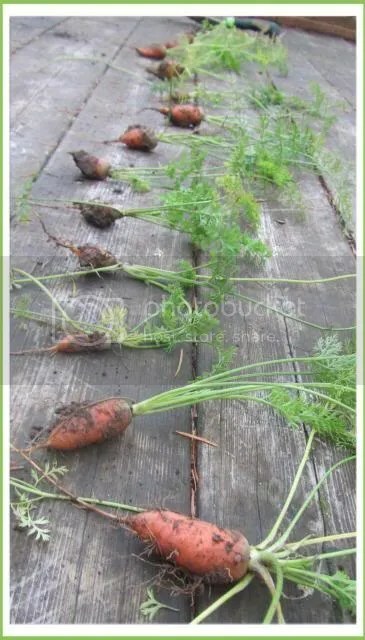 The girls finally dug up some of their carrots this weekend, and they had a blast doing it! Also, the carrots are quite tasty!! 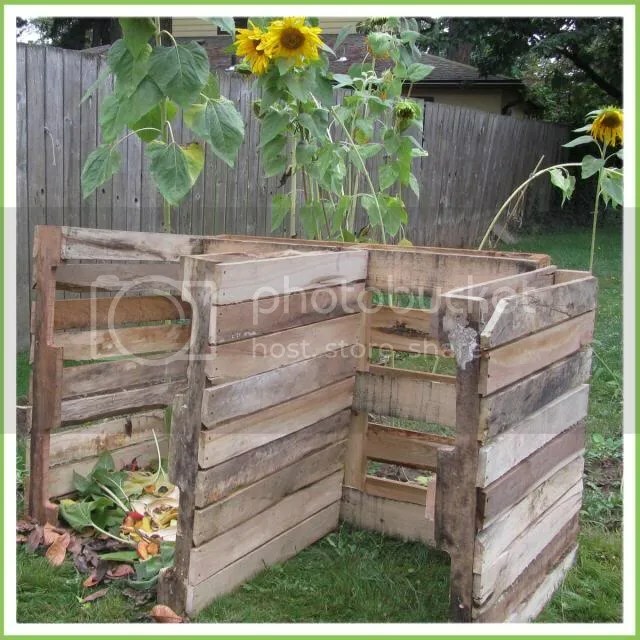 I’ve been wanting to start composting since the moment we moved into the house last spring, however I don’t have great skill with building things, and we didn’t really have money for the wood anyway. I happened to see a compost bin made of pallets in the Mother Earth News magazine a couple months ago, and filed away the info for a later day, and that day finally arrived! 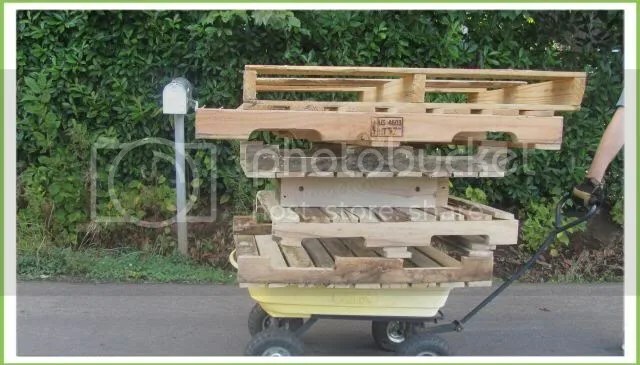 I daily check the free section of craigslist, and sometimes I see free wooden pallets, and email about them, but I’m always too late. So anyway, Sunday morning we groggily stumbled out of bed, turned on a heater, and began poking around in the kitchen for breakfast. I turned on the power strips in the front room, and turned on the computer… …checked my email… then checked the free section… and… FREE PALLETS!! A whole stack of them! 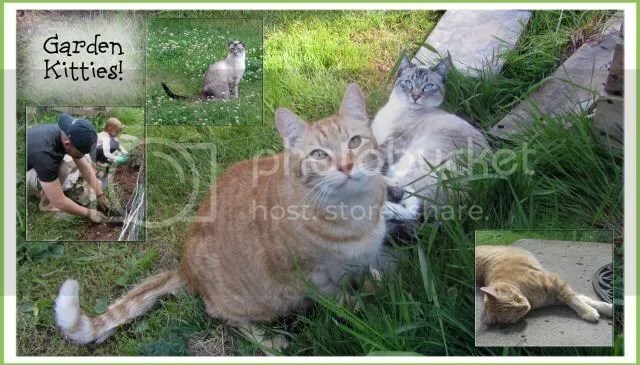 Posted late the previous night, so there was a good chance they were still available, and with an address so I didn’t have to try to contact anyone! I quickly google mapped the address… and… they were only several blocks away!!!!!! Too good to be true! I raced around the house gathering people, shoes, jackets, hurriedly explaining my plan. All Sunday morning sleepiness gone, we shot out the door at a half run, pulling our garden cart, and hoping for the best! The best happened! The whole stack was still there! 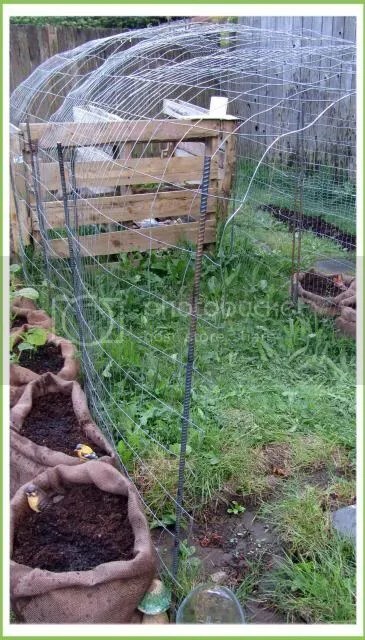 We got the pick of the best ones, and dragged them home eight blocks to build this fabulous compost structure! !